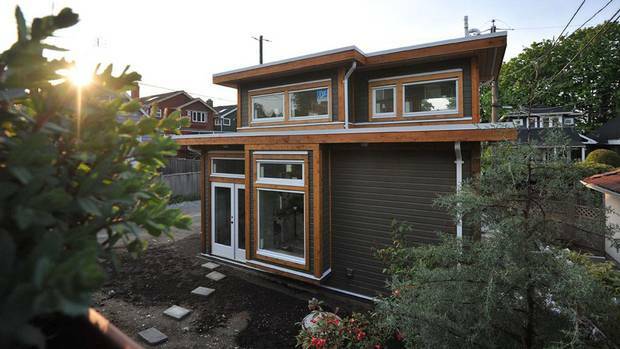 A laneway home designed by Vancouver’s Smallworks Studios/Laneway Housing Inc.
Online classified sites are filling with posts from pilots, lawyers, construction workers and people doing all kinds of other jobs who have tacked on being a landlord as an extra way to help cover their mortgage costs. With cities such as Vancouver and Toronto struggling to cope with a housing-affordability crisis, many people are choosing to rent out secondary suites in, or attached to, their homes as they try to keep a handle on outrageous property prices. The rapidly rising cost of rental units in Canada’s largest cities, along with vacancy rates near zero, mean it’s increasingly difficult for people who rely on rental units to find – and keep – their housing. Like the real estate market, rental prices have become detached from incomes and are forcing people to live in cramped apartments, find roommates well into adulthood or simply move away. The Globe and Mail is spending the summer examining how those factors have shaped the lives of renters, landlords and their cities. The rapidly increasing cost of real estate, particularly in the Vancouver region, has rippled into the rental market, pushing vacancies near zero while causing rates to increase. At the same time, the number of units outside of purpose-built rental buildings has been steadily escalating. Vancouver and Toronto permit secondary suites as a legal renting option – provided they meet certain criteria – and encourage them as a means of generating affordable housing. Other cities, such as Calgary, have struggled with finding a smooth process for regulating such rentals, balancing the need to create more housing with complaints from neighbours wary of introducing more renters into areas currently dominated by single-family homes. There isn't any certification or training requirements to rent out a home or condo across the country, but all landlords are covered by provincial tenancy laws that set out rights and responsibilities of both landlords and tenants. While renter advocates have complained that such laws aren't adequate, some landlords also say they don't have enough protection from problem tenants. Amy, who asked that only her first name be used, is a small-scale landlord, originally from Alberta who has lived in British Columbia for 25 years. She rents out a "mortgage helper" suite in Burnaby and a condo in Coquitlam. She's a volunteer administrator of an unofficial landlord support group on Facebook. Amy says she participates in the group because she doesn't think there are enough resources available for small-scale landlords in the province, or any forum available to register problem tenants. While Amy doesn't deny that slumlords and bad landlords are a problem, she says there is a group of people who do the job simply as a means to get by financially. She worries that many of these new landlords don't know how to properly vet tenants and can end up in tough situations because of it. She feels the current laws don't protect landlords enough, that the eviction process takes too long and can result in landlords spending money they can't afford in the process. "That is the biggest failure," she said. "The government is always talking about housing and how there isn't enough rentals, and the rental [vacancy] rate is so low and prices are so high and you know … if there was better protection in place for the landlords, I can tell you there would be a lot more small landlords." Vancouver, struggling to cope with skyrocketing housing costs, encourages secondary suites and lane-way houses as an affordable housing option and a way to shrink its carbon footprint. A spokesperson for the city says there is no way of knowing how many suites without permits exist, but data shows the number of legal suites has been steadily on the rise. A 2014 report by the Canadian Mortgage and Housing Corp. noted a trend that saw developers in Vancouver including secondary suites in the construction of new residential buildings more frequently. Secondary suites are a contentious issue in the city. They are allowed, with a permit, in certain land-use districts. There’s been a fiery debate ongoing for years about the way the city manages the approval process – criticized for being impractical – for legal secondary suites. An organization was established because of it: Calgarians for Secondary Suites (launched in 2014) has been pushing for changes to the way the city handles approvals of secondary suites, asking that they allow more suites in more areas of the city. Earlier this summer, city council voted down the idea of bringing the issue to a plebiscite in next year’s municipal election. The city has an online registry for legal secondary suites so renters can know whether the suite they are considering has been certified as legal and adheres to the province’s safety code. Regulated secondary suites are encouraged and incentivized in Edmonton – seen by the city as a way to contribute to housing affordability, and a helpful option for sustainable city development. The city offers grants, through its Cornerstones program, which subsidize the cost of establishing these types of suites, if owners promise to rent the space out for five years under market rates. Edmonton rolled out bylaw changes between 2007 and 2009 that made it easier to establish secondary suites in the city. It says these changes, combined with a tough low-vacancy rental market, have contributed to a hike in the number of secondary suites in the city, which has been steadily going up in recent years. As of 2000, secondary suites have been permitted (if they meet certain conditions) in all single and semi-detached houses, and some row houses in Toronto. Before that, they were allowed in certain parts of the city. Gregg Lintern, director of community planning for Toronto and East York said, in an e-mail that the secondary-suite market allows people to live in established neighbourhoods for cheaper rates and also makes the cost of home ownership more accessible for Torontonians. He said that Ontario has recently adjusted its planning act, requiring municipalities to design and adopt policies that support secondary suites. Toronto does not track the number of such suites. Realtor and landlord Lola Bradfield also feels there is no venue for landlords to share information or get support in the province. She says B.C. 's Residential Tenancy Act favours one side – the tenant – over landlords. "The assumption that there are no bad tenants is ridiculous," Ms. Bradfield said. "What the system puts landlords through when they try to rid themselves of a bad tenant: you would think the landlord is the devil and the tenant is some angel that just fell into hell, and that's not the case." It's difficult to get a precise handle on how many homeowners have become part-time landlords. Some cities don't regulate, or track, secondary suites at all, and even when they do, they often measure the phenomenon differently. In Vancouver, construction permits for secondary suites and lane-way housing have increased from just a few dozen in 2009 to nearly 1,000 in 2015. Toronto says it doesn't track secondary suites. Andrew Sakamoto, executive director of the Tenant Resource and Advisory Centre, which provides legal advice and support to tenants across British Columbia, says that he's noticed that "mom and pop" landlords sometimes feel an unwarranted sense of entitlement to their property. "Sort of an 'It's my home I can do what I want' type mentality," he said, adding that the landlords who tend to think that way often fail to educate themselves on their role as landlords, outlined in the province's legislation. He's says that in the past six months, the majority of complaints his centre has received from tenants in secondary suites were about eviction, repairs and noise issues. Mr. Sakamoto says a member of his staff cited a trend that tenants living in secondary suites complained of being pressured out, with these types of landlords either planning to switch to Airbnb, or raising the rent by starting a new lease with new tenants. David Hutniak, the CEO of LandlordBC – the biggest landlord industry association in the province – said his group's members recognize they are running a business and have signed a code of conduct requiring them to familiarize themselves with their own and tenants' rights. However, Mr. Hutniak acknowledges that there is a demographic of landlords who haven't spent the time to understand the act, or who simply don't honour it. This worries him. "They are not only harming themselves and tenants but they are also harming the broader industry," he said. To address that, Mr. Hutniak says LandlordBC hopes to launch a voluntary landlord registry in the province that will require landlords to pass a test in exchange for receiving a certificate of competency. "We've had so many turnovers in terms of housing here and new owners and new condos and all this and I think consequently we've had a lot of novice landlords who have entered the market." He says there are some basics to the landlord-tenant relationship, and that it's up to new landlords to learn them. "It's all well spelled out," he said. The B.C. government notes that the terms of the act don't differentiate between landlords who manage many properties and those who simply rent out suites in their own basements. In Vancouver, Lloyd Cheung's phone has been ringing off the hook. On Thursday, he posted an ad on Craigslist to rent out the basement suite of his house in East Vancouver where he lives with his family. He works in construction, but his part-time gig as a landlord helps pay his mortgage. "I didn't realize how short on housing this city is," he said. "It gets overwhelming. " He says he asks that people e-mail him to express interest, but that he doesn't have time to respond to all the requests he receives. He's been renting his suite – which he says has been fully legalized by the city – for four years now. Sometimes, Mr. Cheung says he gets suspicious calls that make him uncomfortable: people offering to send him money without seeing the suite and inquiries from different parts of the world, which he says he ignores. But, so far, he's never had a bad experience with a tenant. "I treat them like my really good friends, I don't treat them like I'm the landlord," he said. "Because after all they do live under the same roof as I live in, right."